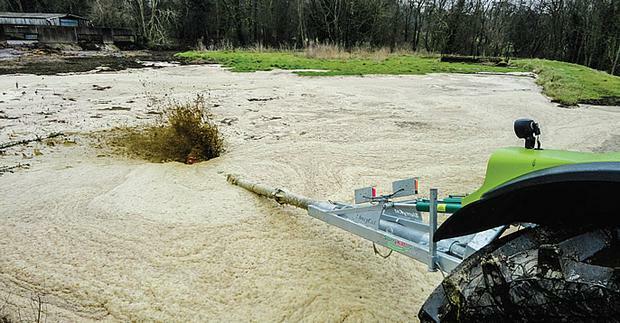 SlurryCat recently showed off its Maxi Mixer agitating a large lagoon in no time at all. The company has said that its Maxi Slurry Mixer range is smooth in its operation and handles agitations with ease, even when the lagoon has a thick grass-infested crust. It says the oil-bathed drive line is totally maintenance free, ensuring many years of trouble-free service, and the propeller offers the correct balance between operational efficiency and minimal power consumption. 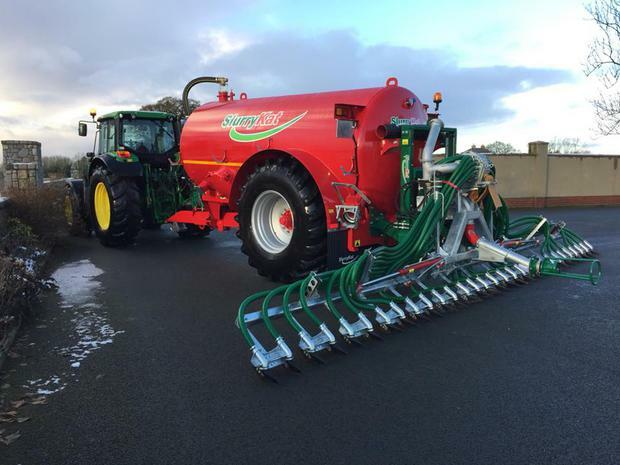 The Northern Ireland slurry machinery specialists launched two new innovative pieces of equipment this year. Ready for use is a completely new trailing shoe injector and a new Bak Pak hose reeling system. The new injector unit has been developed on the back of the company’s highly successful trailing shoe which was introduced in 2008 and has sold over 2,300 units globally to date. The injector unit can easily be mounted to any tanker and then taken off and used with the Bak Pak hose reeler on the SlurryKat umbilical system. The new injector demonstrates all of SlurryKat’s multi award winning innovation and experience seen in all its products. SlurryKat says this latest design is completely new from the ground up in every way. The main innovation, that is totally unique to the new injector unit, is that it is the only unit on the market that can ‘piggy back’ carry a hose reeler containing up to 1,000m of six inch bore hose. Until now it was only possible to carry a hose reeler like this on a dribble bar system. This is only made possible with a further introduction of a completely new 1,000m Bak Pak hose reeler. The current Bak Pak has been the flagship umbilical hose reeling system of SlurryKat since its introduction in 2008 and has sold over 4,500 units globally to date. It is now possible, for the first time, to work the new trailing shoe and Bak Pak together as a complete unit. 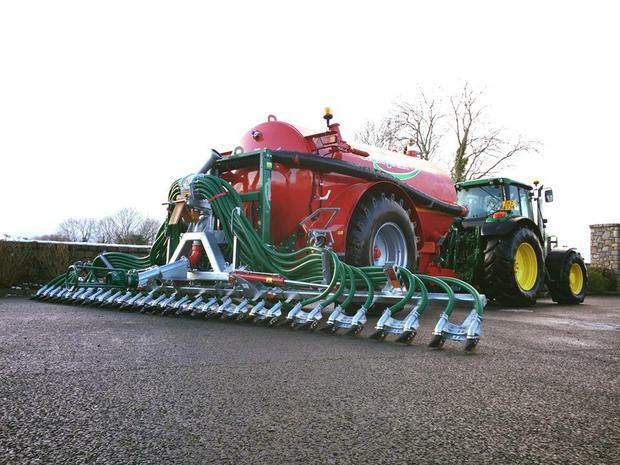 Possibilities with this new trailing shoe hose reeling system are unparalleled demonstrating ergonomics and flexibility that is a ‘must’ in today’s umbilical slurry spreading market. The new trailing shoe offers a fully galvanised construction, new shoe and slurry delivery design that offers a new level of precision and cleanliness for the grass previously unseen before. The unit has flip up shoes meaning that the arms of the tractor or tanker do not need to be raised at headland turns or when crossing the umbilical pipeline. The shoes fold up automatically prior to reconnection with the Bak Pak or when leaving the field after the tanker is emptied by hydraulic control from the tractor seat. 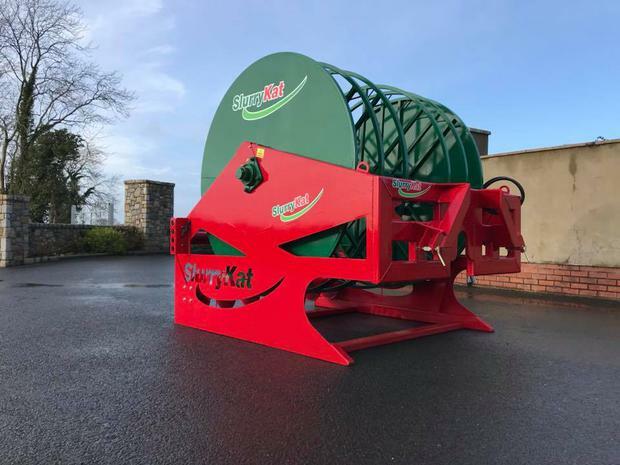 SlurryKat’s CEO Garth Cairns said: “We have been working on these new products for some time now to bring something fresh and exciting to the slurry equipment market. “We are very pleased with the performance and feedback on the new trailing shoe and Bak Pak. “We hope they can be even more successful than the previous generation of both the trailing shoe and Bak Pak that have been absolutely phenomenal for us over the last 10 years exceeding global sales projections year on year.” He said they had more new products to unveil later this year. Working widths presently start at 7.5 metres and 10 metres with plans to grow the range in 2018 offering a 12 metre unit as well. The new injector goes on sale in January 2018 with the company already noting strong pre-production orders for the system. The 7.5m trailing shoe is priced at €13,995, with the 9m version at €15,995. Under the TAMS II, low emission slurry spreading equipment measure, around €2.8m has been given in grant aid to 257 farmers. The most popular items have been slurry tankers, trailing shoe attachment with macerator, dribble bar spreader attachment, retrofit dribble bar and an umbilical systems with base pump, hose reel and fittings.